Shaft Grave V, Grave Circle A, Mycenae. Found in Tomb V in Mycenae by Heinrich Schliemann in 1876. 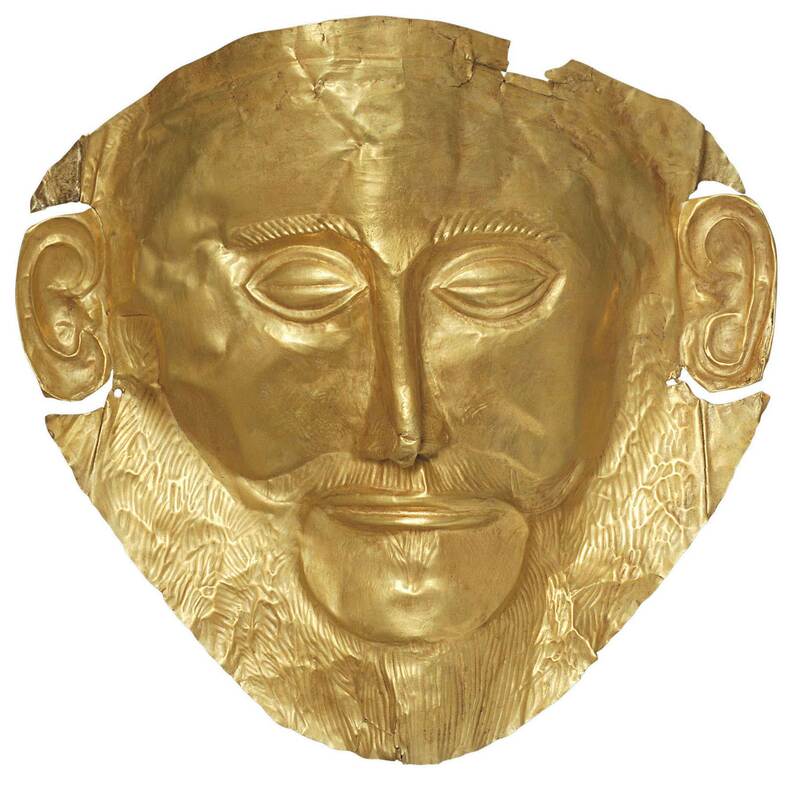 Gold death-mask known as the "Mask of Agamemnon". The Greeks – Agamemnon to Alexander the Great is the most vast and comprehensive exhibition on Ancient Greece ever presented in North America. It brings together more than 500 artifacts from 22 Greek museums, including many pieces never before displayed outside Greece. Among other treasures, visitors will be able to see a number of priceless objects, the result of some unparalleled archaeological discoveries. “I am especially proud to see this unique project take shape as a showcase for Greece, our heritage, and our treasures, illustrating an important part of our history. The fact that 22 Greek museums have come together to produce this exhibition —the largest ever to be held outside of Greece— demonstrates both the scope and the value of this project, as a number of major objects will be travelling to America for the very first time,” stated Eleftherios Anghelopoulos, Greek Ambassador to Canada. The Greeks – Agamemnon to Alexander the Great invites visitors on a breathtaking and illuminating journey through 5,000 years of Greek history and culture. It is the most comprehensive exhibition about Ancient Greece to tour North America in a generation and features some of the finest artifacts of the classical world. Many of the objects have never before travelled outside of the country. The exhibition includes priceless treasures, the fruit of fascinating archaeological discoveries, along with items recounting the epic adventures of heroes of Ancient Greece, from the siege of Troy by Agamemnon to the triumphs of Alexander the Great. The journey begins around 6000 BCE, revealing the deep roots of Greek culture. It ends in the days of Alexander the Great (356 to 323 BCE), whose military conquests created one of the largest empires in ancient history. Along the way, visitors will meet the legendary King Agamemnon, leader of the united Greek forces in the Trojan War (12th century BCE) and one of the great heroes of Greek mythology. They will also learn about numerous milestones in Greek and human history: the birth of democracy, philosophy, theatre and the arts, science and medicine. They will see how the first democracy functioned and discover the tools that made it possible. Visitors will also be able to admire over 500 exquisite treasures drawn from the collections of 22 Greek museums, including the renowned National Archaeological Museum and the new Acropolis Museum in Athens. Among the many exceptional pieces are the iconic portrait of Alexander the Great, found near Pella, the impressive kouroi statues of young men and women dating from the 6th century BCE, and a dazzling array of golden jewellery from royal tombs. All these items come from Greek museums, co-ordinated by the Hellenic Ministry of Culture and Sports – Directorate General of Antiquities and Cultural Heritage, in collaboration with a consortium of museums led by the Canadian Museum of History. All in all, hundreds of golden objects will be presented, including two magnificent death masks from Mycenae (16th century BCE); superb warrior’s helmets; the beautiful myrtle wreath of Queen Meda from the antechamber of the tomb of Philip II of Macedonia (about 336 BCE); and a marble bas-relief representing a young man crowning himself. As they tour the exhibition, visitors of all ages will be captivated by the stories of historical figures like Aristotle, Plato, Philip II of Macedonia and the Spartan King Leonidas, and the epic heroes and gods of Greek mythology, including Achilles, Aphrodite, Athena, Zeus and Poseidon. They will also enjoy captivating interactives, fascinating hands-on objects, and a stunning design treatment.It all adds up to a once-in-a-lifetime exhibition and a truly memorable visitor experience.